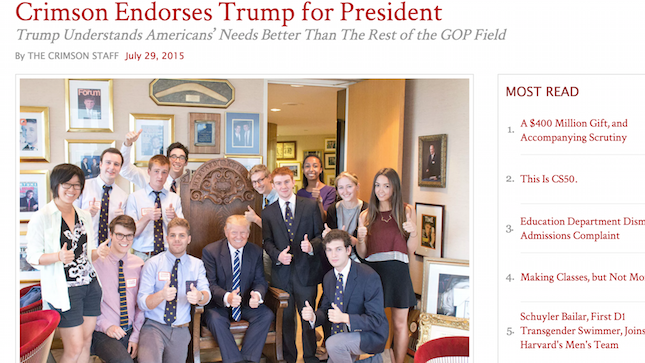 Donald Trump with the liars and fraudsters from Harvard. Donald Trump hit back at the “fraudsters and liars” from Harvard after they tricked him for a photo-op. They lied to him about who they were for a photo. They brought a stolen chair to Trump Tower for the photo – misrepresenting who they were to get the picture. The liberal faculty must be so very proud. Trump was tricked by members of The Harvard Lampoon masquerading as Harvard Crimson staffers into a photo op, under the guise that he was being endorsed by the paper. In reality, the endorsement was part of an ongoing prank war between the Lampoon and the Crimson. Trump was being kind to these lying punks.